The purpose of the community-led housing event was to build on the interest identified during the Festival of York Central. The question of how to make homes on York Central not just affordable but forever affordable was explored during an event during the Festival and this – plus the two boards of post it notes in the exhibition – informed the first of the My York Central big ideas. It is also worth noting that Homes England are interested in supporting community-led housing. We invited James Newton of YorSpace and Jimm Reed from Leeds Community Homes to join us to inform the discussions with their experience and expertise. We began by seeking to refine the brief for York Central – and to explore the links between housing and other aspects of the site. How to stop holiday lets and buy-to-lets? Co-operative or co-ownership models which retain overall control through overall ownership (as used by Yorspace with their Mutual Home Ownership Society). Covenents or other legal means to retain control when ownership is passed to others. How to make sure people around the scheme are gaining from the scheme? One of the ideas that came out of the Festival of York Central was of a social contract which provided benefits for residents outside York Central in return for any disruption or disbenefit which the development caused. How can Leeman Road Triangle share some of the benefits of the development – can two-way investment benefit both? How do you define the boundaries of the community? How wide should the “membership” be? Could the whole of York Central be a Community Land Trust? The role of a Community Land Trust (CLT) was explored. This provides for ownership of the land which means it can’t be disposed of without it being in the interests of the membership. Private housing could still be in there. Affordable housing could then be controlled as (for now at least) Community Land Trusts have exclusion from ‘right to buy’. The community land trust could be responsible for the green spaces – but would need income stream to do this. This raises issues of service charges and stewardship. It is very common to appoint a service company to do maintenance and receive service charges. It was noted that someone is going to be collecting service charges – could it be a community-led body where the money gets ploughed back into the community? This would then create long term stewardship. It was suggested that this could be on Garden City principles, so the community-led body might run commercial ventures so they have a revenue stream and that gets ploughed back in. ‘There is a difference between this and putting faith in a distant council by waiting for them to do something. In a community-led context, people can do it themselves’. ‘This is about York, taking back control’. The discussion led on to making links between the previous event on community-led economic development and this conversation about community-led housing. How can we develop the infrastructure that enables social and economic exchange to work (Phil has written a blog on this to bring this idea to life). ‘there is a strong consensus about some kind of Community Interest Company, that people on the site make the site’. Build a bigger network of people who might be interested in this. How can York Central be designed to work for people who have Multiple Sclerosis? Joanne Chapman lives in York, and blogs about her experiences of being a parent and having Multiple Sclerosis. In this blog, Joanne explores what possibilities York Central might offer disabled people. This is part of a strand of My York Central work looking at how York Central can be an inclusive and accessible place where disabled people can live, work and play. What would your home be like? How would the designs enable you to live? My condition makes the way I live more planned. I just want my home to be easy. My main symptoms of reduced mobility, fatigue and bladder weakness have to be accommodated in the house adaptations. For my mobility, I need to ensure that access to the front and back of the property e.g. getting in and out, access the garden as well as moving around my home is easy. In terms of what I’d be doing, I would like every room to work for me, so the adaptations and design has to assist my condition by making my home more accessible. My aids need to be discreet, so my home doesn’t look like a special home that is “aid central”. I recently went to NAIDEX, a disability conference with one of the aims to help understand how home design can assist me. Homes on York Central could be designed to be easy to use for disabled people. I don’t wish to think how to make my home accessible for a wheelchair but it’s a necessity. With an ageing population and individuals wanting to remain in their homes for longer and not strain services by moving out, new homes need to address accessibility, so doorways have to be wide enough for a wheelchair to easily pass, items placed at appropriate levels from a wheelchair like light switches and plugs, using technology for smart accessibility like blinds and smart door locks so accessing via a chair isn’t an issue, accessibility into and outside the home, to include your garden. Mood is also important especially as MSers have a high likelihood of depression in their lifetime. Different light levels can aid mood. This can be used effectively in different areas of the home. I recently had a company in to provide understanding of the decisions involved before purchasing a stair lift. I spoke about the marketing material the company used which featured elderly people. I told him that I appreciate that the elderly are the target market but everything was marketed towards the elderly (photographs, language used). The biggest learning is not to assume. Not all disability is visible. If I was a designer, I would be getting a range of opinions from individuals who have a wide range of disability. What would public spaces and social spaces be like? What would they enable you to do there? Public spaces need to be redesigned to enable people using wheelchairs easy access, including accessible Changing Places toilets and rest places. Public spaces like my home need to be easy. So a lot of what I’ve written for my home can be applied to public spaces. I’m disabled not because of my condition but because public spaces make me feel disabled as there are usually unfriendly. For example, I visit a local park. The entrance is blocked by a gate. I park my scooter near the gate and use my walking stick to walk in and access the park. I understand the gate prevents bikes entering the park they also restrict wheelchair, scooter and pushchair access therefore preventing many individuals from using. When my mobility gets more challenged I will be unable to visit. I choose not to use this park for its lack of accessibility and ironically it is the closest to my home. For every public place I visit, I think about my condition and how my symptoms of reduced mobility, fatigue and bladder weakness affects visiting them. Before MS, I just went out. How this affects me in York, is proper planning for best parking, places that are accessible (my husband gets me into shops, by supporting me as some York shops have steps. As an old city obviously York wasn’t designed for accessibility). I also think of somewhere to rest and use the toilet. To be honest, I now need to think like this. I also look at how accessible a place is for children too as I’m a mum. Public places often don’t have a resting spot. For example, I visited the York Balloon Festival last year. A blue badge gives you closer parking but not closer toilets and no resting place. If public places addressed this, it would be a god send (like a resting place specifically for disabled guests and families, accessed via a blue badge). Public spaces also includes transport links. At the moment, you usually ring ahead to plan a ramp etc. You’d prefer to just turn up. The partnership with Network Rail presents many opportunities to ensure all aspects of the rail journey is accessible: from using the toilet beforehand (I highly recommend Changing Places toliets) to boarding the train. Being a true Northern powerhouse, we have to ensure all our spaces are accessible, for all children and adults. For those who are disabled or those supporting disabled individuals like a child or if you are a carer. We need to change the current attitude. Social places need to reflect this too. I phone ahead to reserve tables at bars and restaurants. I inform taxi drivers of my condition. Again, like an able person you wish to act spontaneously but can’t. In York Central, I’d like all places would to be easy and spontaneous. Where would you blog from? Are there co-working, live-work arrangements / facilities /networking opportunities that would enable you to write? Unfortunately as public places aren’t accessible, I would write from home. They are currently no facilities/networking opportunities established for accessibility. If this was different I would have a different answer. How would you get around? What transport options would there be? What would enable your mobility? Getting a scooter then a wheelchair on public transport is simply a nightmare. I would struggle independently. I need charge for the scooter. There is no designated area for disabled people to rest or visit the toilet. The main toilets in the city centre have been removed. I avoid visiting the city unless it’s vital. York is bike friendly. I would love to see the city as a beacon place for accessibility. Sadly no place is easily accessible, but maybe York will lead the way? Post its from our Affordable Housing tag asking for an alternative approach to housing – we set up the Forever Affordable event to explore what the alternatives might be. Without question one of the most common issues raised so far during the My York Central process is that of ‘affordable housing’ and particular what it means and how can York Central avoid further investment, buy-to-let and holiday properties. As part of our Homes week of the Festival of York Central we invited Sue Bird and James Newton from YorSpace and Jimm Reed from Leeds Community Homes to share the different models that can be used of ensure homes build to be affordable remain affordable. YorSpace was set up because we genuinely think homes should be forever affordable. We want to create homes that put community inclusion and housing at the heart of housing. We wanted to help ourselves and help others. Mutual home ownership, by developing individual neighbourhoods of people, each their own community co-operative. There will be an ‘asset lock’ – which will help keep the homes affordable in perpetuity. In practice this means that the Co-operative owns all the home, but everyone that lives there will own the company. This stops the houses being sold on the open market. Because we are not-for-profit, we can cut out developer profit. We can build houses more cheaply. Therefore the deposit people need to come up with is less. We then ask for a monthly contribution (to pay off the collective mortgage of the whole co-operative). YorSpace aim for this to be lower than ‘affordable rents’ (as definition 80% market rents). YorSpace are looking for new members. The homes on Lowfield Green are not yet full and there are looking for people to invest. YorSpace will be offering opportunities to buy shares in the community benefit society – this will be launched in July with a target of £500 000 being raised. Q: Will you only do new build or take on existing buildings? Yes, we’ll look at old buildings (started by looking at Oliver House, Bishophill), great to reuse buildings and bring them to back to life. Q: Will £500,000 complete the develop? The £500,000 when combined with residents’ deposits, will act as the deposit to borrow the remaining money to complete the development. Q: Who are the people involved and how does it link to the social housing list? YorSpace is not a social housing provider. We can’t meet the same prices as a Housing Association because we don’t have access the same funding. So we offer ‘affordable’ but not social housing. Q: Do the members contribute to the capital or more of a co-operative rental model? All people moving in will need to put down some kind of deposit because we need to borrow the development loan money. We are trying to make that as small as possible, so the more community shares we sell the smaller deposit necessary. We need to find that balance we can be 100% one way or the other, we can’t just give spaces to people who can afford or who can’t afford it, we want a mixed community can stabilize the community. Q: What has been the community response in Acomb? While there is always concern about the wider Lowfield Green development (our scheme is part of a much larger redevelopment of the former Lowfield School site, everyone who has heard about what our portion represents has been really positive. When they have spoke to us, they are interested in the approach. Q: Could this work on York Central? Yes, we want to replicate this, we’ve learnt so much, we don’t want to do this just once, we want more people that just one development, so this could work for York Central. Leeds Community Homes set up two years ago as a Community Benefit Society. We are also a Community Land Trust, with the whole of Leeds as our community. Leeds Community Homes are also a “Power to Change” funded community housing regional hub/enabler (as a pathfinder). The aims of the hub is to enable new community led housing, working across Yorkshire. The hubs will facilitate communities to get together and produce more of this housing. There will soon be news of a new community housing fund. We’re waiting for the details but are expecting it to be £60m per year for three years directed specifically at community housing. The hubs will be working to get that money out the groups and helping them with the process. The problem with community housing is that it is very capital poor. If we all came together as a group today we couldn’t necessarily have a lot of money to say buy a site or commit to a building contract, so we’re looking to build our ability as a sector to borrow and raise capital. We’re working directly with developers, some aren’t that bad, they are sometimes interested in this type of housing. There is an issue (as raised above with YorSpace in terms of social housing) that most community-led housing is not able to get direct funding for rented housing without being a ‘registered provider ‘of social housing. So Leeds Community Homes are currently developing relations with existing registered providers, like Local Authorities and Housing Associations, as they are in the business of development affordable housing, we are natural allies. 300 passivhaus panelised timber-framed homes being built in a factory on the site. Energy CIC, all have renewal energy and solar panel, everyone lives there will be a member of the company, so they will own and manage their own energy supply. 16 affordable homes generating under Section 106 (link), discounted sale and for rent. Funded that through a community share offer, local people, local co-ops as an investment. Q: What was in it for the developers? It’s quite a community-minded developer, Citu, and they are innovative and interested in different approaches to building a housing scheme. But it also makes the story better for the council, as well as regenerate the area, it is win, win, win all around. Not all developers would go for it. Q: Have you come across an issues of social houses but can’t find a social landlord to take it on? A: Housing Associations don’t want to take them because they can’t deal with the service charges and then the danger is that the developer gets away without doing any social housing. 29 co-housing units, common house. Housing Association partnership building older person flats, self-build flats. Q: Had Chaco been around the a while? Yes, two or three sites before we were able to move ahead with this one. LILAC was how I got into community-led housing in 2009 as a project manager for this group. The group had been looking for a site for years and found a council site, but to the council they were not credible purchasers on their own. So the group found me to act as project manager. All homes owned by Lilac co-op and they all together pay off big mortgage they all jointly have. Community-led housing is more relevant than ever before. There has obviously been the co-op movement for years, so it is not brand new. But with the impact of Grenfell, localism and neighbour planning, there is more interest than there has ever been. People are taking control of how housing is working. This possibility is enshrined in law through the Custom and Self-Build Act which is a planning requirement for Local Authorities to take into account local people wanting to do their own building. There is also the new Community Housing Fund (as mentioned above, more here from Homes England). Q: Is the £60m for loans or grants? It will be for capital grants. Q: Why is Leeds different to York? Difficult to pin it to any one thing. What we are now able to do is to use Lilac as a shining example and now trade on it. That’s helped. Leeds has a of history of co-co-operatives. Local authority has taken the community/ self build thing seriously and has put resource and political capital into supporting organisations like LCH, and schemes like Chaco. Q: What worries me slightly is the more fundamental question about who is making decisions on York Central. There is always this line everything has ‘to be viable’, we need more transparency about what that means. I am concerned by ‘community-wash. I do want community-led approach but I also want big numbers too. How can we make sure we are looking at the big picture and the kind of community we want? Q: I want a mixed community on York Central (and I live near by). I want some who works in a restaurant in town, someone who is a nurse and someone who is one teacher, not just people who can afford a market rent. Q: What do you mean by affordable? Sue: ‘Community washing’ is something we sometimes worry about. There is an important speed issue. If the process goes too fast then you lose the ability for the community to have impact. Pacing is important. In terms of ‘affordable’, what we usually say is ‘low cost’. James and I are the squeezed middle, we’re young professionals but this town is very expensive. The market has become so skewed. Q: What we would like to see is low cost and different definitions of ‘affordability’ for different groups, York Central has been too much what are they are going to do for us or really too us …not what can we can do. Q: Could we develop a locally specific definition of affordability that is tailor to specific people? Perhaps need to be pegged to household income / bearing in mind the number of dependent children. Could it be done on household income? Q: Could we develop pen portraits of people different types of people and what affordable might mean to them. What are your housing challenges? Sue: We know that there are people who have grown up in an area can’t stay. They are moving to Selby or Market Weighton and then commuting in. James: Which has the knock on effect of the environment impact of the travel into the city and the contribution to poor air quality. Q: What is the size of the deposit need. The deposit could still be a big barrier, does your model get over that? Because we will have to initially cover the loan it will, but as we complete developments we can start borrowing against our assets and then our model starts to become more viable. Lowfield Green is very much a pilot. Q: Are there any other ways? Government policy has tended to be focused on help-to-buy and shared ownership, tending toward giving access to the market but not making it cheaper. Q: Council has a housing company, but it is very small numbers. Can we find out more about that? Housing Challenges? Ask people for the issues they are facing to help with the York Central Homes brief. Follow up the discussion with Homes England so we can understand where the funding and policy levers are. Find out more about the council housing company. Explore more different ways of creating community ownership and a stake in decision making. Housing Histories, Housing Futures: What can we learn from looking back at York’s so called ‘slum clearances’? 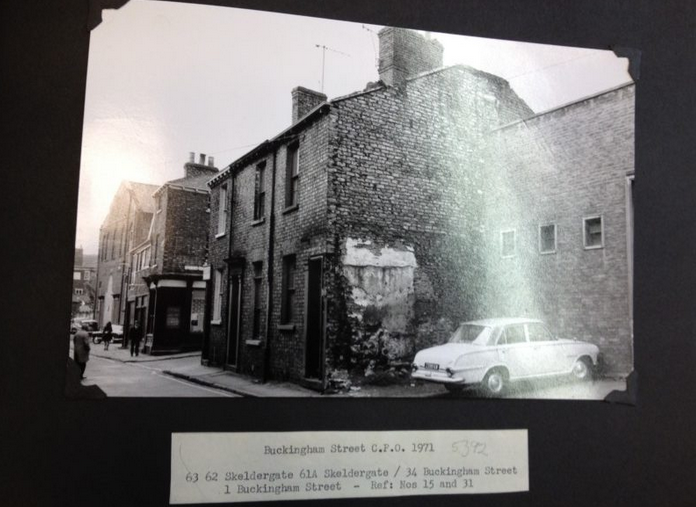 An image from the Hungate archive, used as part of Housing Histories, Housing Futures workshop. The Housing Histories, Housing Futures event in collaboration with York Past and Present and York Explore Libraries and Archives was based on work done in 2015 and 2016 on the histories of housing in York and especially looking at the Hungate inspections and clearances. We opened with Introduction to York Central. A key focus for York Central is homes, with both the Council and Homes England as members of the York Central Partnership which have a specific policy interest in house building. Throughout the session – as we looked back – we kept returning to this question: what principles can we draw out for how government and communities should work together? The majority of adults are in work, the most common occupations being in the Chocolate industries, general labouring jobs, laundry and other domestic type jobs, trades like painters, joiners, wheelwrights etc. but also a few more skilled jobs like a hairdresser, midwife, auctioneer, book binder, dressmaker, druggist and antique dealer. There also seemed to be quite a few people involved with fish, either as dealers or fish fryers. We then went on to look at some examples of health inspections which were used to underpin mandatory improves, leading even to the authorities just making changes and sending a bill through. Even, as Catherine found out, they didn’t know exactly who owned the house in question! In the 1930s the improvements had led to being clearances as people were moved to new housing in Tang Hall and Clifton. Here were found some personal stories creeping soon, a woman who was forced into an institution, a story found by Sue Hogarth, and as you can read below, a letter from a man who was the last on their street. ‘I am the only one left on the street’ the letter reads. Reflecting on how we could see the authorities and people interacting – often individuals seemed very much an afterthought in the 1930s – we skipped forward to the 1970s where a different mood was in evidence. 1970s in Layerthorpe. Housing in red, slated to be demolished. One tenant from Eastern Parade wrote to the Public Health Inspector in January 1973 requesting further information as she’d “held back a week’s holiday which must be taken before the end of the financial year”, so she was “naturally anxious to know if we are likely to move in the near future”. The resident’s uncertainty stemmed from having no news since she visited the Inspector’s office around one year earlier and her concern about a series of “cleaning and replacement jobs which must be done if we are going to be here longer”. This would suggest that there was little transparency or communication with the residents during the process, and again reinforces the lack of ongoing investment into properties already resigned to demolition. We then ended by reflecting on these histories… what principles can we draw out for how government and communities should work together? We noted that in the two major cases of 1911s and 1930s and the the 1970s, that between this period people clearly had come to expect to have more control over their lives. An interesting insight from the discussion was the way on which the authorities treated housing as a problem that need simply to be fixed with improvements or new housing. This had the effect of ignoring all the other aspects of ‘home’, ‘belonging’ and ‘community’. There was however a strong feeling that govenrment is not in itself bad – nd that we needed interveiton from the public bodies involed in York Central. But with greater involvement from local people. Community involvement in designing and building? This lead to a discussion about how communities could be actively invovled in design and build of housing. We concluded with a very interesting discussion – building on the discussion above about language. It would be rare to hear the word slum now – it is considered a negative and pejorative word as the Bishophill Action Group pointed out above. Yet, it was asked, is is possible that affordable does similar work today in that it categorising certain groups and seperating them off from others? During Week 2 of the Festival of York Central we have focussed on the nature of home and the experience of living on a future York Central, looking at the kind of homes and indeed the kind of community that people want to see. In addition, tagging of comments from previous events has allowed us to put responses from the week’s events in a broader context of overall comments and questions. An overall theme is emerging. This is to say a broadly cautious ‘yes’ to high density housing and commercial uses. But, and it is a big but, a form of ‘social contract’ needs to be set up with the people of York. To put it another way, there is a deal to be negotiated here. One that accepts higher density housing on the condition York Central deals with affordability, builds a mixed and diverse community, is high quality for all and makes the benefits of density really work for future residents. Here are the key briefing ideas. The vast majority of the post it notes contributed at the exhibition relating to homes make this point: they need to be affordable, affordable needs mean actually affordable (not only the policy definition 80% market cost) and they need to not just be affordable to start off with but perpetually. This may well require, as discussed at the Forever Affordable event, a locally specific definition of affordable linked to earnings not the market. Many questioned 20% as a minimum and sought a higher percentage. The growing ‘community’ tag in our Flickr album. Community – what is it and how to make it work? ‘Home’ doesn’t end at the front door. There was a desire for home to mean the wider community too. We started to describe what we mean by community, prompted by the discussion with Helen Fielding, Homes England, at the Forever Affordable event and continued the line of discussion through the events. A mixed community was often welcomed – though some warning bells were sounded by others. More work on this is needed (further meetings and discussions are to be held at Derwenthorpe where 40% is affordable, amongst others). There was a recognition that we too often tend to think of ‘family homes’ as a house with a yard or garden and that maybe we need to look more closely at what makes for good apartment living for families. There are examples of multi-storey family homes in London and elsewhere in the UK (plus a lot more in mainland Europe) so feedback will be sought. Similarly there was an interest that as many as possible of the homes work for disabled people and can be designed as lifetime homes. While there is some concern about height and what the proposed total housing number and density might mean, there is a very strong feeling that height can be ok if it is very high quality. That is, the flat is of a good size with high ceilings, is well insulated for noise between flats and has good sized balconies. Good apartment living also requires very serious maintenance and ongoing investment, this would need to be considered in service charges and how this works for the affordable housing would need to be seriously explored. One possible line of inquiry is that very good quality flats might well encourage downsizers and free up family-sized homes elsewhere – but that the quality is key (more on how to achieve this below). Through the exploration of density, it became clear that a ‘social contract’ issue might be to really make the benefits of high density living clear and real. High density should for example mean: good local shops nearby and walkable; excellent public transport network (such as a tram or similar permanent and reliable system); close to gyms, childcare, schools and other community facilities. The most popular alternative name for York Central so far is ‘New York’: if we’re going to have high densities how do we really ensure the benefits of living in urban areas? Many have questioned the need to zone commercial development away from housing and have asked whether a vibrant urban area needs mixed uses. One quote was to ‘think 3D’ – suggesting there might be benefits in having shops, social and commercial at ground level, offices at first floor and flats above to avoid the ‘ghost town’ effect and drive life in the public realm. There have been many comments supporting “highest possible” environmental standards. Going beyond current Building Regulation minimum standards would allow higher standards of comfort (see “it can be high, but it needs to be great” above), higher standards of sound separation from the surrounding railways (triple-glazed windows and mechanical ventilation reducing the need to open windows) and would reduce the likelihood of fuel poverty for those on low incomes. Costs would be raised slightly to cover this investment, but with land ownership being with public bodies, this is seen as a rare opportunity, and would also create a distinctive image for the development. Gardens don’t have to be on the ground – reflecting also the Open Spaces work we did last week, people thought access to roofs, for gardens, for solar panels, made sense. And took advantage of the height for good views. • Policy, governance and funding levers: Alongside developing this initial open brief, we were able to start to explore some of the policy, governance and funding possibilities to make this happen. We will be following up with Homes England on affordable and community-led housing, and developing discussion on what is true affordability. The case for a Community Land Trust has also been voiced – where public elements of the proposal, including public realm, community facilities and potentially affordable housing, could be invested into a Community Land Trust, protecting ownership and status. • Evoking ‘community’: Drawing on discussion started this week, we’ll start developing an open brief for a vibrant York Central community. • Understanding the housing challenges: Based on an idea that emerged at the Forever Affordable event, we’ll be seeking people who have stories to share about their housing challenges and how York Central might offer an answer. • Co-design? Clearly there is an argument that to get quality – and to really attract families, disabled people or downsizers for example – the housing could be usefully co-designed. We’ll be looking for people interested in exploring this idea further. What are the roles Homes England might play in York Central? Homes England are a key partner and landowner in York Central. They are also the government agency charged with promoting house building. Many of the questions that are arising from the My York Central process are about affordable housing: ‘what does ‘affordable mean?’ ‘why 20% – not more?’ ‘how can we ensure homes built to be affordable stay so and not get sold off for holiday homes, investments or buy-to-let?’. To explore these questions Phil and I met with Helen Fielding, the Senior Specialist for Home Ownership and Supply for Homes England. Before joining Homes England, Helen was the strategic lead for housing for two local authorities and, in her Homes England role, has particular responsibility for affordable and community-led housing delivery. What is the role of Homes England? In York Central we are wearing different hats, we’re land owners as well as potential funders and strategic promoters. It was a bold move to buy the land. It was about us saying how – as the national housing agency – are we going to intervene in the housing market so it can deliver what it needs to deliver. As delivering housing is our central purpose and mission, our involvement brings certainty to the process. That was a proactive step, how do you get away from being tied to those markets and market driven forces? The most powerful way is to take control. The Homes England leader on the York Central Partnership, Dilys Jones, is passionate about York and it really is her personal commitment and vision that drove this very proactive decision. But we have other hats too. We are potential investors and funders of the project. York Central is a priority site for capital investment into infrastructure, and as part of the York Central partnership, Homes England is investing significantly both in bringing these proposals to fruition and accessing these central Government funding opportunities. In addition, we could be development financiers of the homes to be developed on the site, through our Home Building Fund which is aimed at for small and medium-sized builders as well as larger firms. There is also a role we might play in terms of funding the affordable homes. The role of local authority (City of York Council) is key. The Council have set a 20% minimum for affordable housing which the developers will have to cover under what is called ‘Section 106’. But because we administer the Government’s affordable homes schemes there is an opportunity for additional affordable homes beyond the Section 106 requirements to be funded via our Affordable Homes Programme if this is viable. This will clearly need further investigation and scrutiny given the financial position of the project. As Landowners who have bought land with public money we need to cover our investment, but we are keen to be active brokers, we bought ourselves a seat at the table. The aim is not necessarily for us to maximise our profit at all costs, but to deliver as many of the right types of homes as possible, as quickly as possible. Why not more than 20% social housing? York Central is a big brownfield site with lots of remediation and infrastructure requirements. The site has effectively been stalled for c20 years. Most of these costs (which are really significant) will need to be paid for by the development. So affordable housing – whilst really important – is just one of the issues that needs to be considered alongside all the other site requirements, and the development does need to be viable. Despite these challenges we’re committed to delivering 20% of the homes on site as affordable housing. There is a very crucial deliverability test – in other words, for the economics of this development to be viable – when setting policy requirements for Section 106 housing. What we might be looking at is the right mix of affordable housing within the policy-required 20% and collaboration to see how to produce more affordable housing in the widest sense in the rest of the site, which might include self-build, community-build or possibilities like older persons shared ownership. How can we ensure that housing built to be affordable stays affordable long term? New homes can be secured as long term affordable housing if it is specified in the Section 106 agreement. One mechanism for this is if there is a portion of housing which is ‘discount for sale’, you can restrict the resale value in perpetuity. You can express the resale value as a fixed percentage of open market value (noted in the National Planning Policy Framework, within definition of ‘affordable in perpetuity’). More mortgage lenders are opening up to shared ownership and intermediate home ownership options, and mortgage finance is more readily available now. Other forms of affordable housing in perpetuity are Affordable Rent, Social Rent and shared ownership. Are there specific issues in York – and for York Central – because housing is so unaffordable to so many? In York there are a significant number of people that cannot currently access market housing as well as a lot of people who need social rented housing. I am talking about people who wouldn’t necessarily think of going into social housing but can’t afford to buy at current market prices. There is a lot of scope within this intermediate market for other forms of tenure that are not social rented housing, but are not open market housing either – but between the two. This could be affordable rents at up to 80% of open market value, Shared Ownership or Discount for Sale home ownership options. Within the 20% mix, there is obviously a need to ensure there are some rented housing (council or housing association) options as well as intermediate, and beyond the20% there is the opportunity to seek grant funding to intervene in the market to create a greater variety of possibilities for this intermediate market. There has been a lot of questions about Community-led Homes, what are the possibilities for York Central here? Homes England are charged with contributing to the Government target of building 300,000 homes a year by the mid 2020s. We’re simply not going to get this many homes built in the timeframe only by relying on the big 6 housing developers. We need new delivery partners, we need local authorities and Housing Associations to do more, we need to attract investors to come and develop private-rented housing as well as housing for sale, we need self-build and we need community-led forms of development, we need to encourage much more diversity in the players involved in delivering housing. In York there is clearly a growing head of steam community led with YorSpace. One issue is access to the right kind of land opportunities. One option could be to enable community-led housing by facilitating the supply of those sites by sub-dividing and servicing sites and smaller plots, and making them available to small builders, self-builders and community groups. Our emerging role in Homes England is increasing intervention in the land market to make land available for all sorts of types of housing. In a rural context we are interested in a revolving land bank model, similar to an example in the Highlands, it is acquiring rural sites, putting in infrastructure, servicing and obtaining planning permission and then making them available to housing associations and community groups, capturing the uplift in value as the land is sold on. In York they’ve got a self-build register going but it seems we do need a bit of a handholding service to act as intermediary, currently due to cuts the council can’t do that? For Homes England, community-led activity is about affordable housing. The Community Housing Fund is about to be launched which is likely to include revenue grant funding to support the development of community-led housing proposals. This is a great opportunity to support some capacity building within the community-led sector, as well as support individual projects’ development. We’re hoping to be able to launch this Prospectus in May. The Community Housing Fund is £60m a year. It was first launched in December 2016 with 148 local authorities receiving initial funding, York wasn’t included in that first wave of funding. The next wave will be to invite bids following the release of a funding Prospectus, we hope in the next few months. Phase 1 of the Community Housing Fund is likely to provide revenue support to groups to get up and running and fund pre-development costs. It can allow them to employ professionals, cover planning applications and design fees. It doesn’t help with buying land. It can provide capital funding for small scale development, access roads, sewage, electricity and we expect this element of the fund to be routed through the local authority. We are also likely to be able to provide revenue funding to local authorities, for staff in order to build capacity. There is also a plan to provide national funding for the development of a network of Community-led support ‘hubs’ as a resource for new and developing groups. Phase 2 of the Community Homes Fund is hoping to offer grant funding to support the development costs of delivering community led affordable housing. There are a few issues to sort out with this. For example, at the moment if you want to be the landlord of affordable housing for rent, you have to be a registered provider, like a Housing Association. We’re currently trying to understand if there is another way to support community groups who don’t want to Register or partner with a Housing Association. Shared ownership is a tenure where the resident buys a portion and rents the other half, Homes England can also grant fund that. This can be a really good option for people who want to own their home and can afford a mortgage, but perhaps can’t raise the full deposit, or need time to develop a positive credit history. It allows people to own their own home in stages, by buying more of the equity in their homes as their circumstances permit. We can fund this tenure now, through our Affordable Homes Programme, and people who want to provide this tenure don’t need to be Registered Providers. We think this might be an attractive option for community-led housing groups to consider. A big question raised so far is how to keep graduates and housing cost is an issue there, what about if the Universities, produced low rents to keep graduates developing start ups? It is all possible. It is about segmenting the market and then producing the right kind of housing to make a vibrant and sustainable community. The My York Central ‘Community’ tag on flickr, taken from conversations with the St Barnabas Coffee morning on Monday 26th March. This issue of how housing and making a community interrelate seems key. What might useful ways forward in developing this conversation? One key question for the York Central Partnership is ‘what is the criteria for land disposal?’ Is it money, quality, community engagement? As we said earlier, Homes England is using taxpayers money to finance this development, so we can’t sell at a loss. But there may be an opportunity to collectively explore how we maximise social value for this once in a lifetime opportunity to build a new community in the heart of the City, using all partners’ expertise, financial influence and capacity. It seems like from our discussions there is a possible structure here for the conversation between local people and York Central Partnership. There is something about a brief – which might be prompted by the question ‘what community to we want in York Central?’ That could then influence the criteria for land disposal. A segmentation could be produced through that to help indicate the different types of housing identified to meet this. Then look at the variety of delivery mechanisms, including market, co-creation, partnership community-led and self-build working to make it happen? This is the kind of conversation Homes England would be really interested in taking part in – and could potentially facilitate in various ways – in York Central.